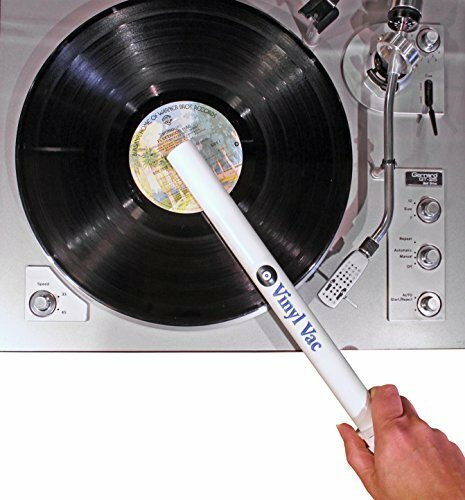 THE VINYL VAC 33 - Vacuum Wand for 33rpm Records! THE AFFORDABLE AND EFFECTIVE SOLUTION TO VACUUM YOUR VINYL RECORDS! You no longer need to spend hundreds to thousands of dollars in order to effectively vacuum your record collection! Your turntable stylus while tracing the vinyl groove will encounter dirt, dust and grime that has attached or embedded itself to the vinyl. This results in the pops, clicks, hisses and noise that takes away the premium sound of the vinyl experience. The only way to truly pull the deep down dirt and grime embedded in your vinyl grooves is to lift it off with a vacuum. Vinyl Vac will effectively do just that for a fraction of the price of expensive vinyl vacuum machines. Some vacuum systems out there can cost anywhere from $200 to $4,000. The Vinyl Vac is only $29.97 and will lift the dirt and grime out of those precious vinyl grooves. Simply apply your favorite cleaning solution and then use the Vinyl Vac to ensure that you are lifting the dirt and grime behind. Vinyl Vac is designed to be used with your own vacuum cleaner or shop vac. The Vinyl Vac attaches to any standard vacuum cleaner hose (1 1/4") and some larger. Soft velvet around the intake will protect your vinyl while working loose embedded dirt and grime for the vacuum to lift from the grooves. Your order also comes with a pair of replacement pads, an O Ring to aid in providing a snug fit between your vacuum hose and the Vinyl Vac. Also included in your order are two suction reducers that will allow you to better regulate the amount of suction. We recommend the use of a wet/dry vac and the Stanley 1 Gallon, 1.5 HP wet/dry vac is a perfect fit with the Vinyl Vac. It is available here on Amazon. The Vinyl Vac 33 will effectively remove dust, dirt, debris, lint and grime that is embedded in your record album grooves. Your turntable needle will thank you for providing it with a clean surface and therefore enabling it to perform at it's highest potential. If you have any questions about this product by Vinyl Vac, contact us by completing and submitting the form below. If you are looking for a specif part number, please include it with your message.